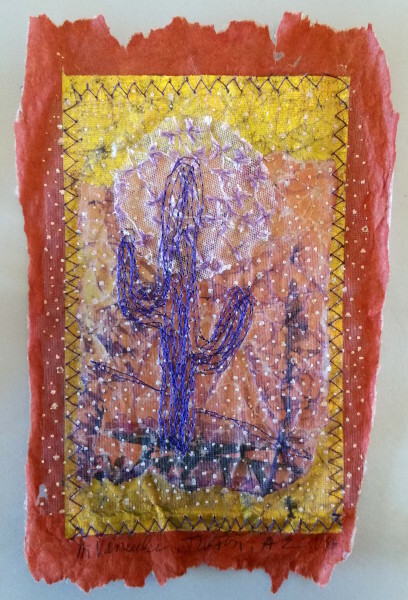 So this weekend I spent a delightful couple of days with mixed media artist Cas Holmes and seven other artists to learn her techniques altering the surfaces of paper and fabric with color, collage, and stitch. Cas invited us to submit at small piece (mine was about 5” by 3”) for her Tea Flora Tales installation at Visions Gallery in San Diego this spring. Tea Flora Tales is comprised of many of these small works suspended from the ceiling. Click here for a short video of the installation at the 20th European Patchwork Meeting. Cas is fearless in her use of found papers and materials. Used tea bags, old magazine papers, and flour sacks are just a few of the ephemera that can be found in her work. I am sure to incorporate some of these techniques into future work. Celebrating Tucson at the Cas Holmes Tea Flora Party. Made from Joss paper, tulle, lace and stitch. Lovely to meet you all for this impromptu session. We loved the class, Cas. I hope to see your show this spring in San Diego.